En noviembre del 2012 entre por primera vez en las carreras de atletismo extremo de Spartan Race. Comencé con una carrera de categoría de 21 Kilómetros cual aún no consigo olvidar, ya que fue una experiencia extrema de mucha adrenalina y sufrimiento. Esta fue una carrera cual me inscribí en equipo con un grupo de amigos. Por lo general, cada uno de nosotros ya teníamos cierto nivel de atletismo pero quería medirme en este tipo de carreras. Aún recuerdo bien esos 21 kilómetros de recorrido bajo una tormenta, el viento azotando, con un frio de invierno en las praderas cerca de Sacramento, (la cuidad capital) de California. Primero que todo debo resaltar que estas carreras presentan todo ese elemento sorpresa donde nunca puedes anticipar la distancia exacta, la posición de cada de sus diversos obstáculos en la pista. Los obstáculos son de estilo militar oh inspirados por los entrenamientos militares. Hay varios factores y elementos que influyen mucho en estas carreras como el terreno y el clima. Como puedes correr en una pista diseñada en algún estadio, también puede ser en alguna montaña remota con altura y nieve. Los directores de estas carreras raramente cancelarían un evento de estos por cuestión de lluvia oh temperaturas templadas oh bajas. Uno técnicamente firma un contrato donde declara que corre todos los riesgos que esta modalidad puede implicar. La distancia a cubrir en estas pistas puede variar entre los 8 Kilómetros hasta una distancia de 50 Kilómetros con un promedio entre 25 a 70 obstáculos diversos. En estas carreras, al atleta le toca cargar oh jalar objetos, subir cuerdas oh escalar paredes, redes de carga, atravesar columpios, a todo esto se le incorpora la natación ya que a veces tienes que atravesar alguna distancia en el agua, arrastrarse bajo alambrados de púas, atravesar fandangos de lodo donde si no te pones pilas puedes hasta salir sin calzado, mover oh voltear objetos masivos como una llanta de tractor de un peso de 500 libras, clavar flechas al blanco, memorizarse algún código como prueba de memoria. Estas carreras miden en ti todo tu nivel de resistencia y capacidad física como también mental. En lo personal este es un tipo de modalidad que me ha ayudado a medir mi nivel de capacidad física y a diario me ha motivado a entrenar constantemente para estar siempre preparado para lo inesperado. Mis entrenamientos consisten en trabajo de resistencia cardiovascular y fuerza muscular. Como entrenador certificado del CrossFit, siempre me gusta entrenar el CrossFit ya que es una disciplina de acondicionamiento y gimnasia funcional. Aun siendo entrenador de esta disciplina y teniendo acceso constante a un gimnasio, parte de mis entrenamientos consisten al aire libre como haciendo carreras en senderos escarpados, senderismos cargando chalecos con peso y costales de arena. Todos estos entrenamientos me preparan al igual, para mis escaladas en montañismo de alta montaña. El domingo 2 de octubre se llevaron a cabo los "2016 Reebok Spartan Race Championships" en Lake Tahoe, California. Esta carrera de resistencia extrema se le conoce por la categoría de "Spartan Ultra Beast" cuál consiste de una distancia de alrededor de 50 Kilómetros en una pista con más de 60 obstáculos con algunos elementos de estilo militar. Con estos eventos, Spartan Race está consiguiendo popularizarse a nivel mundial ya que en muchos países ya se llevan a cabo este tipo de carreras. Aunque parezcan retos extremos y rigurosos, el entrenarse para este tipo de carreras es beneficioso para la salud y calidad de vida diaria de cualquier persona. Llevar una vida de espartano implica formarse metas constantemente, trabajar arduo para siempre estar listo para cualquier situación imprevista que la vida pueda presentar. Ser espartano es llevar un estilo de vida sana cual a diario fortaleces tu poder de mente, cuerpo y espíritu. Como espartano aprecias ser parte de una comunidad de personas dedicadas cuales sus propósitos siempre son en llegar a ser mejor seres humanos. 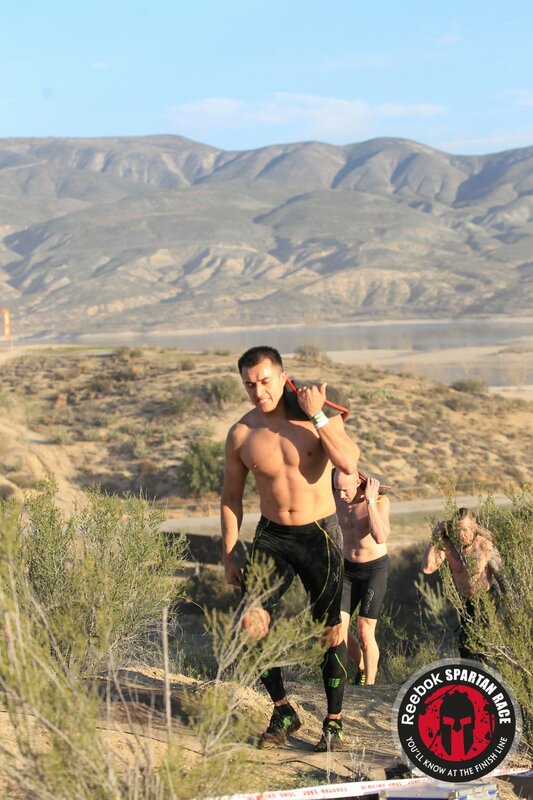 BattleFrog has expanded into the West Coast bringing OCR fanatics like myself a new obstacle course experience. On February 20th, BattleFrog held their first Northern California race series in beautiful Sonoma Lake. My friends and I woke up early morning to make the drive out to Sonoma; we arrived by 6:00AM and ran into many familiar Spartan Race faces. It was still dark, temperatures read 37 degrees Fahrenheit, and the ground was still muddy and wet from earlier rain. Entering the grounds I knew it was not a Spartan event but saw many Spartans with finishers t-shirts. For us here in Northern California, had not yet seen or participated in a BattleFrog event but the rituals were about the same; runners getting their warm ups, entering the starting corral etc. In our racing packet, was an orange wristband for Elite heat racers. Coach Pain, our MC at the starting line gave us final instructions, “I want to see Integrity, I want to see Power, I want to see Strength!”. Off we went, all of us wearing our orange bands. We committed to two 10K laps, a total of 13 miles of some of OCR’s toughest obstacles. Unlike Spartan Race, there was no burpee penalty for Elite runners, you either complete the obstacle or hand in your orange band. The two most challenging obstacles by far were “Tip of the Spear” and the “Platinum Rig”. For “Tip of The Spear”, imagine traversing a 10 foot inverted wall through ropes and wooden ledges. Although I did not struggle with it, it was taxing on my forearms and my core. The hills added an extra challenge to the course, a few so steep I was bear crawling a few feet. I estimate it was around mile 4.5 when it was time for the “Jerry Can Carry”. Our mission was to carry two 45 pound jugs for about 250 meters on a muddy down & uphill. During the first loop I tried to maintain my grip strength so I took two small breaks on this obstacle. I finally arrived at the rig which was at around 5.5 mile, a 20 foot long rig that at first sight appeared similar to the Spartan Race World Championship rig. It was mentally challenging to see so many top elite runners making multiple attempts at completing this obstacle. I immediately analyzed my chances at completing this obstacle. Looking at it closely, the 20 feet rig was much tougher than the Spartan Championship rig; it consisted of hanging ropes, gymnastic rings, hanging steel poles and steel bars & beams. I knew good grip and momentum was key so I shook my arms and decided to go for it. Little did I know the rings and steel bars were dripping in wet and just like that, I slipped three quarters of the way. I made the mistake to rush it on a second attempt and failed at the very same point as my first attempt. At this point my forearms started to burn and I knew I couldn’t afford to tax my grip strength and so I took a slightly longer break. I made my third attempt after seeing that the group of runners attempting the rig was getting larger but failed again. At this point my forearms started feeling rock hard and I felt a bit frustrated as the rig was taking a toll on me mentally. I took a much longer break, stayed collected and took the time to strategize the best way to nail those points of transitions. I finally made it on my fourth attempt. Touching the last ring at the end of that rig, I felt free to continue making progress on the course. I caught up to my friend, Horacio Pastor, at around 1.5 mile on the second loop just right before the “Tip of the Spear” and we decided to run the rest of the race together. Once again, our focus was to preserve as much of the grip strength as possible to save ourselves for the rig once again. We arrived once again at the rig and we knew exactly what was ahead of us. I tried to retain that muscle memory of how I had gotten it the first time around and so I did not hesitate and decided to do it in the same fashion. HOOYAH! My grip and forearms felt great and nailed it on my first try without any struggle! I have seen how Horacio had nailed it on his first attempt during the first loop. We train together and I was confident he had the grip and upper body strength to repeat his success at the rig. At this stage of the race, the rig was the game changer. Those who did not have grip strength left were stuck at this rig, making several attempts and feeling the pressure of the minutes passing by. I decided to stay with Horacio to show my support but it was on his sixth attempt that we decided that it was best for me to cross the finish line and come back later for help. He spent more than an hour on the rig before he successfully completed it on his 14th attempt. My friend Horacio Pastor and I celebrating our finish! Follow him on Instagram as hpx_ocr to see more about his experience. While my time was not competitive (5:31:17), I feel proud that I kept my Elite band and that I was there for my friend Horacio. As my first BattleFrog, I was looking forward to proving that I am Elite among the OCR community that I have known and admired at Spartan Race. Not having the burpee penalty eliminates the probability of someone avoiding the penalty as we have seen in a few Spartan Races. Many of us Spartan Elite racers get frustrated when we witness lack of integrity on the Elite heat. Band over burpees! Out of 57 men in the Elite heat, 28 kept their Elite bands. I am beyond impressed with the 6 out of 19 women that completed that rig, and they did it twice! Those that left home without their bands will definitely be back! With OCR, a failed obstacle adds more fuel to the fire and motivates us to overcome any challenge. I feel extremely proud with anyone that faced the BattleFrog challenge, with or without their band at hand! It takes heart and commitment to get you through a course like the one in Sonoma Lake. Among the top three finishers, I can proudly say my boy Johnny Luna-Lima took 2nd with an impressive 2:20:31 finish. Only 1 minute and 13 seconds away from the 1st place finisher Matt Kempson. Not only does he have speed but he completes obstacles quickly and efficiently. Being only 20 years old, we will see him on the podium for many races to come! Battleling is Believing! What’s Next? Overall this was such a great and humbling experience! I couldn’t have done it without the support from my beloved girlfriend who never misses any of my events. I hope for more events here in the West Coast so I can test my mental and physical abilities. I trained on grip strength for this race but felt that I could have done more of it. In addition, I lost ten pounds in an attempt to improve my times and I must say that I feel lighter and faster. Now that I am familiar with BattleFrog, I will be signing up for their next event in San Jose on August 6th. At this time, I am preparing for their endurance race, “BF Extreme”, in which you complete as many laps around the course as possible in 8 hours. BattleFrog, See you in San Jose! With one month into the new year, I want to take some time to share my 2016 goals. Writing down my goals holds me accountable and allows me to focus on progress throughout the year. 2015 was an incredible year, it would take me more than one blog to explain all the accomplishments that surpassed my expectations. I choose to share my pictures rather than go into too much detail. That brings me to my first goal of 2016, share more pictures! For mountaineering, my theme this year is "Climb High", advice given to me by Alex Honnold during his book signing for "Alone On The Wall". As a Californian, I have enjoyed exploring the Eastern Sierras and there is still so much more to explore within the U.S. For 2016, I am packing my bags in April to climb Pico de Orizaba in Puebla, Mexico. With an elevation of 18,490 ft/5,636 m, it will be my highest climb thus far. In preparation, I plan to climb other peaks in California and Oregon. With El Niño season, tracking weather conditions will be crucial to ensure successful submits. Expect more details and updates on Pico de Orizaba. For OCR, my theme this year is "Move up the Ranks". With the popularity of OCR increasing, new elite competitors coming in, and veteran racers gaining experience, the sport competition is strong! In 2015, I wanted to compete in every distance, collect trifectas, and prove that I can endure back-to-back racing. I ran multiple races in a day, while being sick, and sometimes without much recovery time. This year, I shift my focus to ensure I am racing 100% healthy and prepared. I am also taking a more strategic approach to focus on Spartan Race Ultra Beasts, in the World Championships in Lake Tahoe and Hawaii. As an OCR athlete, I want to compete against the best and at different race series. In February, follow me on Instagram as I train to compete at Battle Frog in San Francisco! This year I also want to help others. I receive messages through social media from many people preparing for OCR or wanting to attempt adventure climbing. I am always happy to help by sharing my experiences with others. My goal with this website is to share with you my journey. Feel free to contact me if you have any questions about training, preparation, or want any tips. I want to also take the opportunity to announce that I am participating in a Spartan team competition on NBC from the producers of American Ninja Warrior. Be on the lookout for Season premiere dates and showtime details as we get closer to Spring! Looking to climb Mount Shasta? With a summit sitting at 14,179 feet of altitude, mount Shasta makes for perfect entry-level of mountaineering. Climbing mount Shasta during regular climbing season requires a great deal of preparation both physically and gear oriented. its most popular route is know as Avalanche Gulch! This route should never be underestimated as it will present you with a real test of will and endurance. This route requires a class II & III of mountaineering and it starts at Bunny Flat trail head 6,950 feet of elevation with a vertical gain of almost 7,300 feet to the summit over a stretch of 7 to 8 miles, for a total of ~14 miles round trip. This route can be accomplished in one day but is commonly climbed with an overnight stay at Helen Lake at about 10,443 feet of elevation to better acclimatize to the high altitude. If you're looking to do the one-day-challenge, it is advisable to start by midnight to better capitalize on the well-compacted and frozen snow. Planning and preparing accordingly well in advance for this climb is important in order to have a higher summit success rate. If you're not used to doing long treks, it is highly recommended that you start doing cardio work and also hiking on steep terrains with a weighted backpack on your back to better simulate the weight that you will be carrying during climb day. Should you be interested in climbing Mount Shasta feel free to contact Ronald as he can be of help! Please visit Latino Outdoors by clicking here for my blog post regarding my Mt. Shasta solo climb on May 30,2015.